Behold the latest goddamn species discovered on Earth! The big male seems to be ready to rip apart your two arms while grabbing your thighs with those lower hooks. You wouldn't be able to scream because he'd be cracking your head with those jaws to eat your brains. Fortunately, fellow humans, these beasts are tiny. 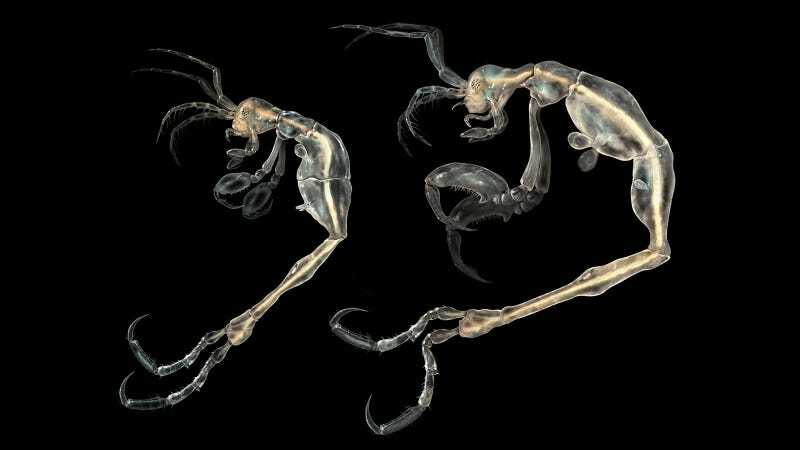 They are Liropus minusculus, a new species of skeleton shrimp discovered in California's Catalina Island by a team led by University of Seville's José Manuel Guerra-García. In reality, they are not shrimps but caprellid amphipods between three to four millimeters long. It doesn't matter. They will haunt my dreams tonight.